chosen as their "P" element will be featured in their post. If you came from Linda's Blog then you're on the right track! My letter "P" stands for Penquin. 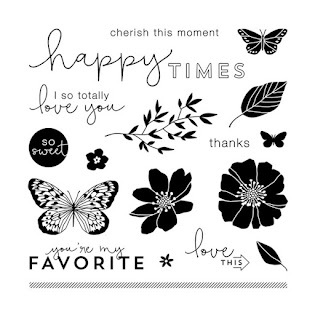 I adore our new Hostess Reward stamp sets. 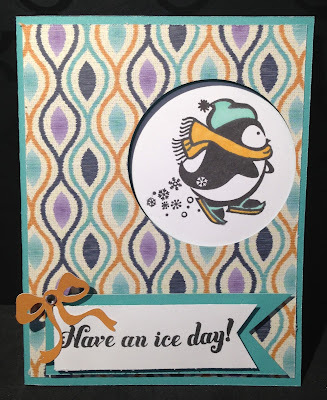 I am a big Happy Feet fan so these penguins on the Wintry Wishes stamp set make my day. Are you wondering how you can get this stamp set?? Host a gathering and use your select product credit earned on exclusive stamp sets only available through January 2014. 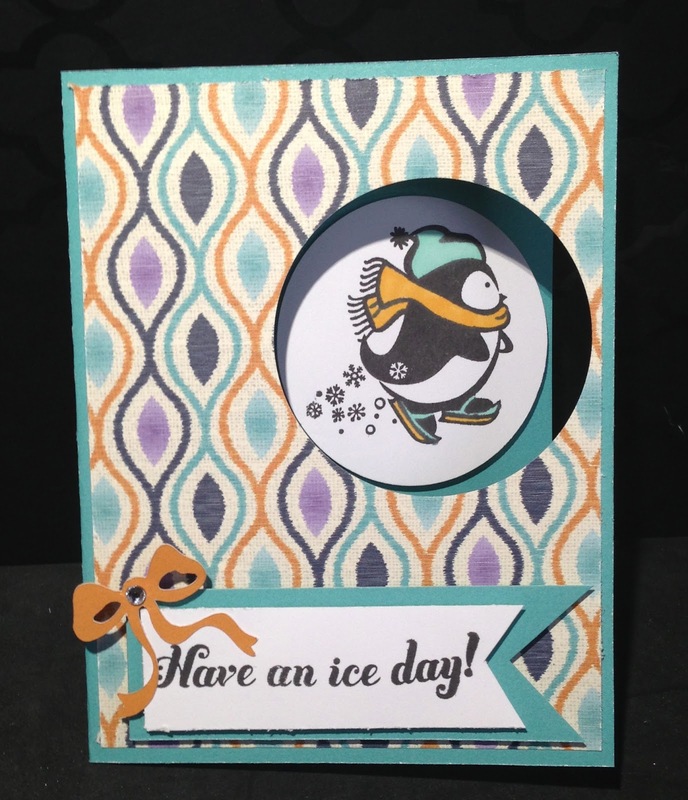 The new Sarita paper pack was used to create my cards. The new Artbooking cricut cartridge assisted me in making this cute bow which has a little bitty sparkle right in the center. The bow was cut from page 61 Shift Lock >Border > F. I free hand cut the banner the sentiment is stamped on. To make the window I simply used a large circle punch I had. I then punched the same exact circle in white and stamped the image. I colored it using Spectrum Noir markers. Here you can see the card from a angle where it is closed. I used 3-D foam tape under the banner to give it some dimension. Here you can see different angles of the card. This card was fun to make. I again used the Sarita paper packet along with the Color Ready Seam Binding Ribbon. I love that I can make the ribbon any color I like using the different ink pads to coordinate with the paper. 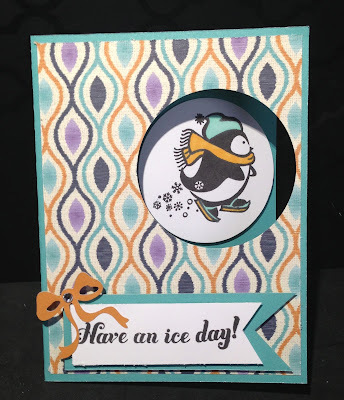 For this card I colored the ribbon with Lagoon Ink using a piece of my round sponge. 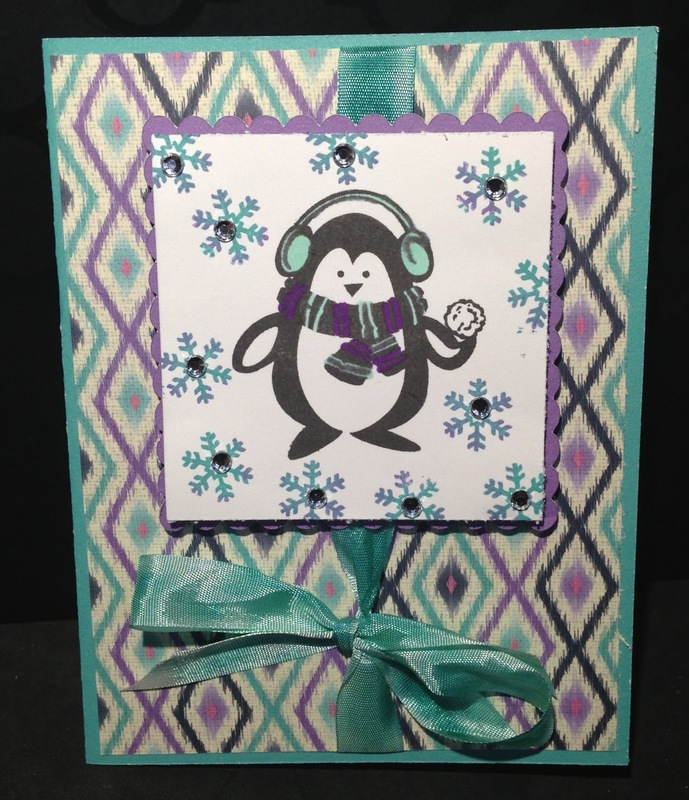 I placed the ribbon down the center of the card and adhered the pattern paper on top. I tied a bow near the bottom of the card. 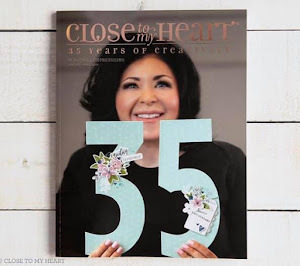 I cut out a photo mat with scallop edges using the Artbooking cartridge page 59 using Shift Lock > Photo Mat 1 > S. I used the 3-D foam tape behind the photo mat and the stamped image. I randomly stamped snowflakes around the image using Gypsy and Lagoon Ink and adhered bitty sparkles to the center of the snow flakes. I hope you enjoyed my cards. 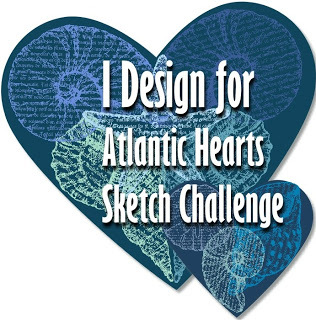 I love comments so leave me some love and Happy Crafting!! 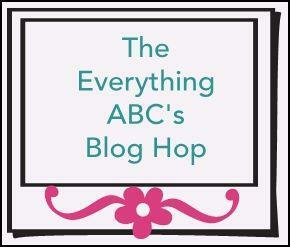 Your next stop on our Everything ABC'S blog Hop is Shelly's Blog. I am in love with everything you did here!! 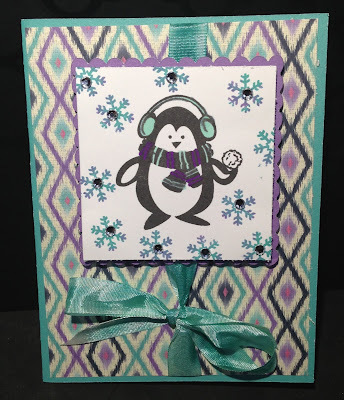 I never would've thought to use that paper with those penguins and it's so perfect!! I WILL be copying for my own personal use! Super cute cards. Love the penguins. Ideas, ideas, ideas!! Thank you!! I just love those penguins!! 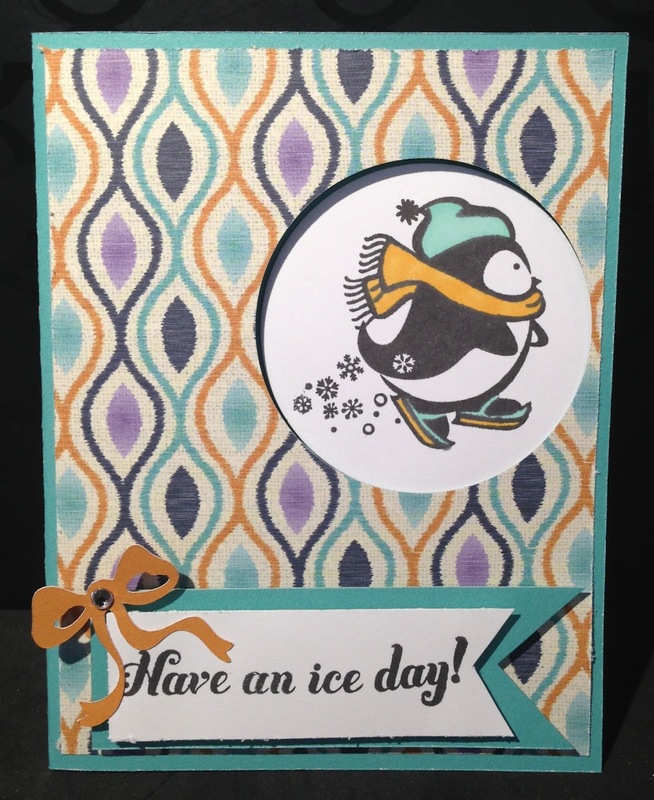 I love the Sarita paper with the penguins! Too cute! Cute, cute, cute!! And I love that paper! Thank you Tracey!! I don't have to many animals stamps but these penguins were a must have for me!! They are too stinkin cute!